Here's A Quick And Easy Way To Create Thank You Pages For Your Downloadable Products - And Substantially Boost Your Profits By Upselling After The Sale. An upsell is where you offer additional products for sale on your "thank you for ordering" page, so customers who've just bought one thing from you are offered more products. By catching customers when they are already in the "buying mood", you stand a much better chance of making additional sales, substantially boosting your profits. It's a well-proven strategy and used by many of the Internet's top marketers. But despite the potential profits, most marketers don't bother to market anything on their thank you pages. This is usually because it's hassle to create lots of thank you pages with upsell offers on them. 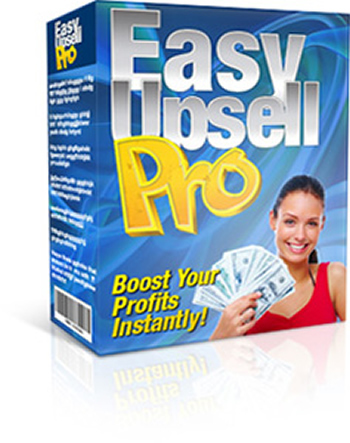 And that' where Easy Upsell Pro comes in, providing an easy way to build thank you pages that include all your upsell offers. With this simple solution, you can set up a new thank you page in two seconds flat. Requirements This software is for use only on PCs running Microsoft Windows. The software generates a special PHP script file that you upload to your website. The script requires a web host that supports PHP (most quality web hosts support this as standard).